Play Your Part has partnered with Leadership 2020 Seminars and One Day Leader to bring the PYP experience to your doorstep through the Play Your Part Roadshow and the PYP Cube. 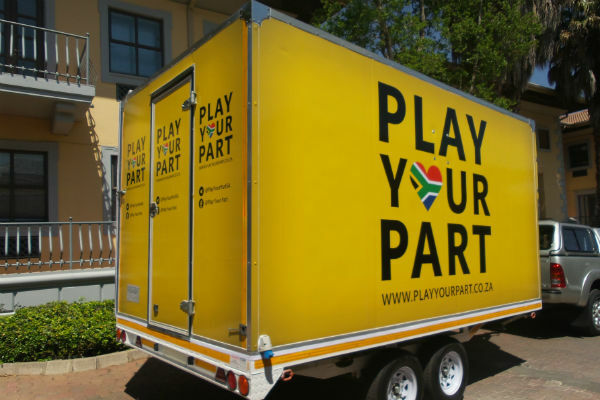 The Play Your Part team, along with partners and various stakeholders, are travelling around South Africa to share inspiring stories and insights into how regular South Africans can make our country great through active citizenship. Check out the video of their travels here. South Africans are urged to keep an eye out for the bright yellow PYP Cube that will be visiting various venues around the country. If you spot our Cube in your area, don’t hesitate to take a look inside. Carrying a range of different tools like tablets, camera’s and interactive screens, the Cube acts as a platform for people to engage with Brand South Africa, play Your Part and partners. In the Cube, you can pledge to your fellow South Africans that you will do your best to help improve the country for all in any whichever way you can. Everyone can make a positive difference in their own way. Tell us how you are playing your part to help improve the lives of those around you through your everyday actions? Even if you don’t get the chance to interact with the PYP Cube, you can still make your pledge. Just submit your story or video to our website and let us know what you are doing to improve the country for all.